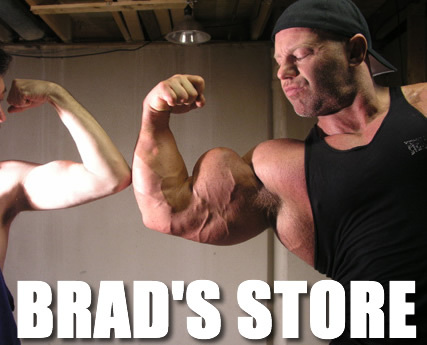 When you are as MASSIVE and POWERFUL as Brad is, you tend to get challenged by every gym rat anywhere you go. On a recent trip to Idaho, two college athletes thought they were strong enough and issued a strength and power challenge to Brad. Brad accepted and the games were on! The only stipulation would be that Brad himself would choose the tests. Rebar bending and tug-of-war lead off where the two athletes are overpowered and humiliated by Brad with such ease, he doesn't even break a sweat! Next is a modified tug-of-war that has to be seen to be believed!!!! Brad ties each guy to the end of a rope, but has them in such a way that they seem like two horses pulling a chariot. Brad lets them get a little ahead of him before he slowly starts to pull them back. His arm, shoulder, and back power outclassing their combined leg strength as they try desperately to pull away from him! Football tackle practice -- both athletes end smashed on the floor as they attempt to ram Brad off his feet. Brad finally tires of these "games" and grabs each guy by the throat, slamming the against the wall and then crushing them there mercilessly. Brad begins a rant about no man being able to challenge him while still crushing the athletes into the wall! In the end, one athlete ends up passed out on the floor from a long, excruciating Brad bear hug and the other ends up pinned and crushed underneath Brad's 310+lb mass of muscles. The only question now: who's next?????? ?